Hilda at From Overwhelmed To Organized, thank you for always stopping by my blog, and showing me so my support with my Linky Party. 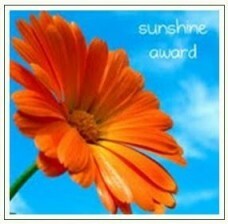 The Sunshine Award is given from bloggers to bloggers who positively and creatively inspire others in the blogosphere. 9. Favourite day - Everyday!